On this week’s living history show (8:30 p.m. Thursday on WOSU TV), we’ll introduce you to the Columbus Sign Co. — a local company behind the creation and preservation of some of the city’s most iconic images. In the meantime, we’ve put together a self-guided tour of cool historic signage around downtown Columbus. Some are neon; some are newer than others. But each signals a different local story. Walk or drive to these destinations for some nostalgia and discovery. We recommend starting on the south end of the tour so you can finish at the North Market and grab a bite (or two). Click on the location pins in the map below to see some pictures and learn more about each stop along the tour. 1. Uncle Sam’s Pawn Shop Inc. — 225 E. Main St.
2. Hawk Galleries — 153 E. Main St.
3. Little Palace — 240 S. Fourth St.
4. “Restaurant” sign — 150 S. High St.
5. Ho-Toy — 11 W. State St.
6. 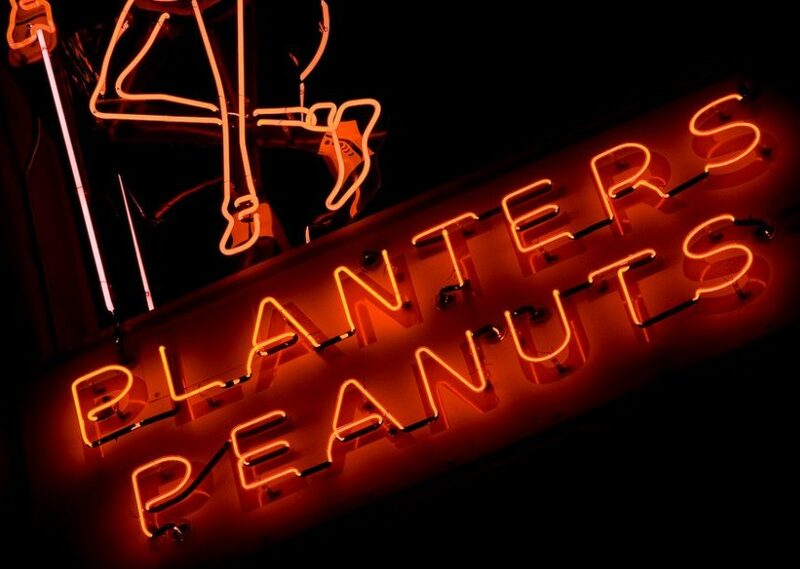 Planters Peanuts sign at the Peanut Shoppe — 21 E. State St.
7. Ohio Theatre — 39 E. State St.
8. The Columbus Dispatch (former building) — 34 S. Third St.
9. Tip Top — 73 E. Gay St.
10. Palace Theatre — 34 W. Broad St.
11. Beacon Building — 50 W. Gay St.
12. Elevator Brewing Co. — 161 N. High St.
13. North Market — 59 Spruce St.
History is all around us, reminding us of our roots. We take a look at the ways local history lives on today — through iconic images around Columbus, legislative buildings, famous phrases, documenting history in the making and more. Watch at 8:30 p.m. Thursday, Feb. 1 on WOSU TV! This entry was posted	on Tuesday, January 30th, 2018 at 3:26 pm	and is filed under Blog. You can follow any responses to this entry through the RSS 2.0 feed. Both comments and pings are currently closed.